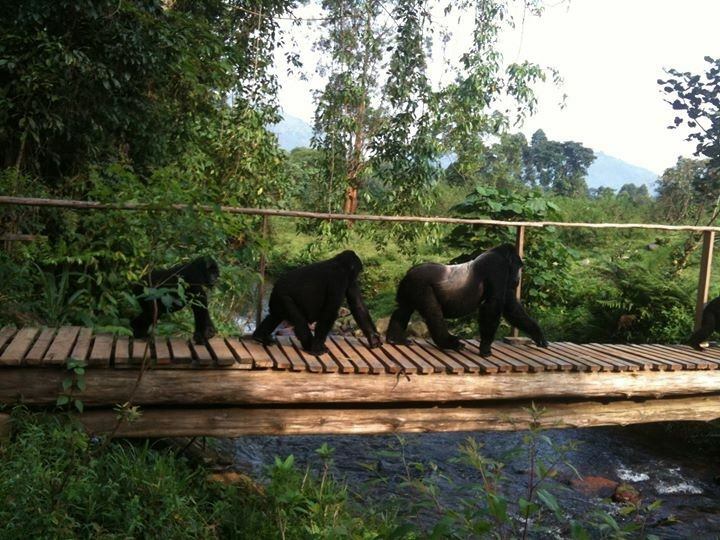 Enjoy once-in-a-lifetime wildlife encounter of rare mountain gorillas in their natural habitat. A superb unforgettable experience showing you the true wonders of Uganda with stays at luxurious forest lodges. Bwindi National Park is home to half of the world’s population of endangered mountain gorillas, living happily in protected rainforests dating back over 25,000 years. With an expert guide you’ll track gorillas on foot through the dense forest which is home to seven primate species. You’ll get insider access to one of Africa’s last remaining gorilla sanctuaries. When Winston Churchill set foot in Uganda in 1902, he was so overwhelmed by the beauty of the country he called it the ‘Pearl of Africa’. He was right. This where the East African Savannah meets the West African jungle. Where else but in this uniquely lush destination can one observe lions prowling the open plains in the morning and track chimpanzees through the rainforest undergrowth the same afternoon, then the next day navigate tropical channels teeming with hippos and crocodiles before setting off into the misty mountains to visit the majestic mountain gorillas. Enjoy an unforgettable experience from the local Ugandan community showing you the true wonders of Ugandan hospitality. Home to the Gorilla population. Bwindi is home to half of the world’s population of mountain gorillas. What is the best time for a Uganda Wildlife Safari? Welcome to the East African primate capital of Uganda! Upon arrival at the Entebbe International Airport, a representative will meet and transfer you to the Ugandan capital city of Kampala where you will overnight. Depart from Kampala to Lake Mburo National Park. The drive is approximately 5 hours, en-route stopping at the Mpigi Drum Makers where we will watch the ceremonial drums being crafted using methods passed down through generations. You will also stop at the Equator to take photographs. Enjoy a game drive on the way to the lodge. In the afternoon enjoy a boat ride viewing a diversity of animal and plant species: crocodiles, hippos and birds including pelicans, Black Crake and heron. After an early morning game drive, enjoy your private transfer from Lake Mburo National Park to Bwindi National Park. It is here within the Impenetrable Forest where almost half of the world’s population of Mountain Gorilla reside. The travel time between these two diverse locations is approximately 6 to 7 hours depending on local conditions. Wake up early and depart with a picnic lunch to track the rare Mountain Gorillas (hiking boots required). The tracking may take between 5 and 8 hours. The Park Guides with you interpret the flora and fauna and the lifestyle of the Gorillas. Return in the evening for dinner and overnight at the lodge. Early this morning, your guide will take you for a forest walk. Bwindi has several hiking trails where you will have opportunities to see and learn about primates, many species of birds, butterflies, trees, and other organisms. Sit back and relax as you transfer from Bwindi to Entebbe International Airport by private vehicle. The drive is approximately 9 hrs. Depart from International Airport. Mihingo Lodge is a luxurious lodge in a magical setting adjacent to Lake Mburo National Park. Perched high on a rocky kopje, whose pre-Cambrian granite boulders were formed over 500 million years ago, it has spectacular views over a vast savannah landscape. Designed to blend in with its fragile surroundings, this environmentally friendly lodge offers comfort, relaxation and the experience of being at one with nature. Mihingo Lodge has 12 luxury, tented rooms designed to provide guests with privacy and tranquillity. Each room has its own unique charm and character, whether it is nestled in forest, overlooking the lake, perched on a rocky outcrop or down by the water hole. The dining and bar facilities are also set on raised wooden platforms that provide stunning views of Lake Mburo. An infinity pool overlooks the valley below where buffalo, eland, impala, warthogs, bush buck and zebra can be seen at the waterhole. Mahogany Springs offers privacy and serenity blended with optimal comfort in a spectacular setting with some of the most luxurious accommodation in Uganda. The feeling that you will experience when staying here is beyond comparison. Accommodation:Each of the 8 Suites has its own private exquisitely designed terrace with panoramic views of the surrounding area. Gorilla trekking, nature walks, bird watching, cultural interaction with the Batwa Pygmy tribe and tree planting. Inclusive of 4 Nights luxury accommodation, private transfers, park fees and Gorilla Trek permits.